Sometimes, possibly often for you lot with real jobs, I need lunch like instantly. There are various reasons for this affliction. I forget to eat and suddenly realise I am ravenous to the point that eating small children is a real possibility, I have terrible time management and have actually scheduled writing a major essay and replying to various emails when I should be making lunch, I go out to do chores and whilst out become completely ravenous (see the issue above). You get the point. Sometimes you need lunch to be done in the amount of time it takes to heat a ready meal. Ready meals. Mmm. They taste so often like curdled muck that I just can’t traumatize myself with them anymore. No really I can’t. No matter how many small children are in danger. And, in the spirit of talking about instant food, why does anyone eat Pop Tarts? I sampled one the other day out of mere curiosity rather than need. (You can buy them at Thrupps.) Mistake. It tasted mostly of cardboard with a little artificial something-something thrown in for special effects. I think eating actual cardboard would have imparted more flavour (and been more enjoyable). So clearly you need a recipe that takes all of five minutes to put together. Preferably less. This is it. This particular carnation is adapted from Plenty – that book of vegetarian loveliness. I have recently decided that the meat binge I’ve been on has to come to an end. Not in the I’m-turning-vegetarian sort of way but more in the I-will-endeavour-to-eat-more-meat-free-meals kind of way. This is my attempt at that. I thought about doing a whole meat free week which seem to be all the rage at the moment and shuddered dreadfully. My body went into a kind of lock down, don’t you even dare kind of mode that made me reconsider. Plus that takes more planning than I have energy for. Don’t get me wrong, I love a lot of veggie fare and eat more than the recommended five a day. But a whole week? I can think of two meals. That means I’ll get to Wednesday and give up. Clearly these things need planning. Speak to me at the end of July and maybe I’ll try again. Things are a little busy right now without having to think of how to feed myself without bacon. Anyway, I digress. Plenty is the kind of book everyone should have on their shelf. Its written by that genius man Yotam Ottolenghi – of Ottolenghi in Notting Hill. I want to make everything. And all that I’ve made so far has been legendary. This particular recipe can be made in large quantities to feed your masses and is super delicious. This is the cheat’s version. Make your own pesto (with basil and parsley) if you would like to keep things more authentic. My need for lunch feels not. Slice the courgettes into 1cm rounds. 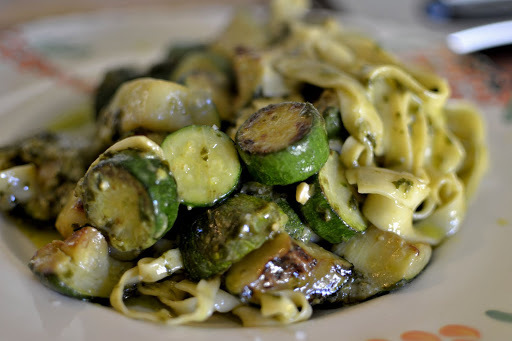 Heat the oil in a non-stick pan and fry the courgettes until lightly browned. The courgettes should still have a small bite to them. Add in the pesto, followed by the mozzarella. Turn off the heat and allow the mozzarella to melt. In the meanwhile cook the pasta according to instructions. (I used fresh pasta-the four minute kind, which cooks whilst you make the sauce.) Drain the pasta and toss in with the sauce. If necessary, re-heat everything together. Enough for two.